Perspective drawing is a good style to use when drawing in 3D. There are different styles including single point and two point perspective. 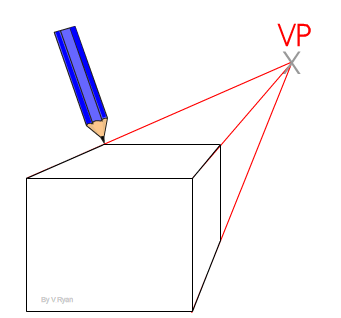 The basic example below shows how to construct a simple single point perspective drawing of a cube. Using the same skills more complex drawings/designs can be drawn, after a little practice. 1. Draw one side of the cube and select a vanishing point (marked with an 'X'). 2. Draw very faint lines from each corner to the vanishing point. 3. Draw horizontal and vertical lines for the 'back of the cube. 4. Go over the faint perspective of the cube so that the lines that make up the cube are dark and sharp.